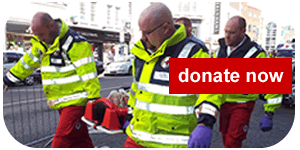 We are one of the main providers of first aid and ambulances services for sporting, social and community events in Limerick City and County Area. We are the primary provider of medical services to Thomond Park Stadium, Munster Rugby, University of Limerick as well as other events such as Special Olympics, Circuit of Munster Car Rally and the Great Limerick Run. We crew all our vehicles with highly trained medical personnel including Emergency Medical Technicians (EMTs) and Emergency First Responders (EFRs). Our crews undergo rigorous training, assessment and reassessment at regular intervals in the areas of wound care, fracture management, medication administration, C.P.R. / AED and ambulance skills to ensure that our volunteers follow current best practice in patient care. Our EMTs and Paramedics are on the Pre-Hospital Emergency Care Register and the Irish Red Cross is approved by the Pre-Hospital Emergency Care Council (PHECC) to implement its Clinical Practice Guidelines. A bike support unit with two mountain bikes. We are also fortunate to be able to count a number of healthcare professionals among our members, such as Doctors, Nurses and Paramedics. In addition, as a national organisation, we can call on resources available in Clare, Tipperary, Cork and Kerry as well as further afield for large events. If you are an event organiser in the Limerick region, and you would like to discuss First Aid and/or Ambulance cover for your event, then please contact us. We can offer you considerable experience and expertise and we will work with you to help you fulfil your requirements.